Pond fish add color, interest and fun to every garden pond! Plus, they’re an integral part of the equation that keeps your water garden clean and healthy. Green Vista stocks several varieties of pond fish. Available sizes and prices vary in season. Please call for our current availability. 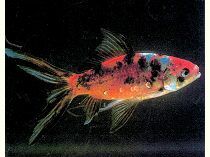 Comets (a slimmer, long-finned goldfish) are colorful, affordable and very adaptable pond fish. They are good fish for the beginning pond owner. Shubunkins are a cousin of the comet with multi-color markings. 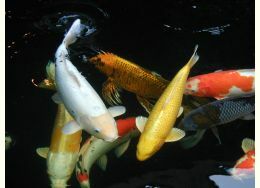 They are a good substitute for Koi fish in a small pond. 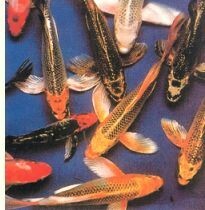 Koi fish are bred domestically or are imported from Japan. They are colorful and grow to be quite large under ideal conditions. Koi need a large, deep pond with good filtration. Butterfly Koi are a newer strain of U.S. bred Koi fish with beautifully long flowing fins and tails.